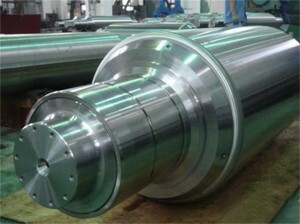 Products type: X2Cr13 Conveyor roller of rolling mill. The conveyor roller of rolling mill producing process: Forged round of martensite—- Tempered —- Rough machining—- Finishing —-Inspection— Packaging. The material is a chrome-alloyed heat treatable steel with medium carbon content. Which is rust proof. Consequently it has a good corrosion resistance. For the reason that its chrome content in moderate aggressive, non chloric substances like soap, solvents and organic acid. This material shows its highest corrosion resistance with fine grinded and polished surface. The machinability of the material is comparable with alloyed heat treatable steels. Similarly causes no significant difficulties. The material can be hardened by holding the temperature between 950°C and 1050° C with a subsequent cooling in air, oil or polymer. The strength of the material depends on the tempering temperature.There are two heat treatment conditions. One is QT700 and the other is QT800. The application of this material is in mechanical engineering and power engineering. （1）. Diameter of outstretched shaft affect the mechanical properties of the hearth rolls. In Figure 3 shows the results below we can see, with the increase of the diameter, the value of the torsion deformation resultant vector decreases. From 0.664E-3 down Low to 0.512E-3, to improve the Stiffness of hearth rolls. But when diameter of elongate shaft increases from 40mm to 60mm, the maximum stress values did not change significantly, diameter of outstretched shaft d generally selected about 60mm when designing. (2) Effect of thickness of ring plate to mechanical properties of hearth roll. In Figure 4 below shows he results. When changes in the thickness of the ring plate of hearth roll (t = 50mmt = 100mm), Impact strength and stiffness of the hearth roll more obvious. When the thickness of the ring plate is reduced, the strength and rigidity of it is weakened. Thereby increasing the possibility of damage of the hearth rolls under billet weight motor drive and furnace temperature interaction. (1). Ignored the effects of various friction. (2). Almost all position welding are ideal for welding. At first according to the requirements of the calculation accuracy the finite element model subdivided into a grid chart. As a result the part of thin-walled made of the shell elements. Similarly part of collar plate are made of solid elements. Completion of the corresponding element real constants and materials parameters define the operating (Young’s modulus EX = 206, the thermal expansion coefficient of 0.45E-6, Poisson’s ratio of 0.28 and a density of 7800). 2) Determine the constraints condition. First ao all in the analysis process, except angular displacement of the x-direction on surface of the hearth roller ends is free. While other linear displacement and angular displacement are restrictions. Likewise symmetry constraints are imposed on symmetry boundary of finite element model. Above all can ensure that the symmetry of deformation. 3) Solving and result processing. By analyzing the deformation and stress distribution of the hearth roll y-axis direction in the billet pressure, weight, torque, and the furnace temperature (1050 ℃) and other loads. Hearth roller cone body weld stress maximum and lower weld strength here. Therefore this may explain the reason that weld fracture is the main failure mode in a way. Therefore they are possible to optimize the design through construction to improve stress distribution. Similarly to minimize the stress at the weld cone body. Hearth roller is a typical centrifugal casting pipe fittings. It is one of the important components in support of metallurgical equipment and transport slabs. As a result it has wide application in Continuous casting- rolling production line. In the rolling process first of all to heat the steel slab to 1050 ~ 1150 ℃ rolling temperature in the furnace continuously and stably. Furthermore stable support of the slab through the hearth roller to ensure a smooth and uniform delivery. Since intermediate section of the Hearth roller mounted on the billet calcining furnace directly the furnace temperature is about 1150 ℃ during the process of production. Hearth roller usually was manufactured with ZG45Cr28Ni48W5Si2 and other high-temperature alloys. Meanwhile since the intermediate section of the hearth roller mounted in furnace directl the tapered section. Similarly the bearing support section are mounted inside the calcining furnace and outside the furnace respectively. The temperature gradient of hearth rolls is very large at different parts. Consequently the hearth roller welded together by the sleeve and cone and shaft generally. In order to reduce the burning of the inner surface of the cone the inside of the cone have insulation board. Which ensure the smooth delivery of high-temperature slab. Requirements: hearth roller shaft not deformed. And external roller ring heat-resistant, wear-resistant. Research shows that the hearth roller is use of large in the metallurgical industry. almost it has high manufacturing costs. Similarly has a long-term high temperature overload working conditions. Consequently prone to failure damage. 1. Welding performance of high temperature nickel-base alloy is poor. Prone to weld cracking and other defects. 2. Welds to withstand pull – push alternating stress loads. Prone to fatigue fracture. 3. Weld is cold-hot junctional zone, exists of large temperature gradient cause thermal stress, thermal stress will accelerate fracture. and improve its life by structural optimization is very important. Consequently it may improve the quality of the product. It is a effective way to enhance the competitiveness of products. c. Considering the material expansion coefficient of Sellite6 alloy and 00Cr17Ni14Mo2 is not the same. The proper clearance retained between part 2 and part 4. And to prevent zinc adhesion between part 2 and part 4 causes applied force to part 2. That is because sink roll bush returned to normal temperature after bush off lined. Similarly the graphite gaskets installed in the gap between part 2 and the part 4.
d. After rollers mounted the gap between the shaft end and the bush inner end is less than the gap between the roll end and the roll arm stopper. Consequently the actual use of the process it could easily lead to shaft end wear at first then the roller head was worn after. Therefore Sellite6 alloy part (part 2) put to the bush in the middle in order to increase the gap between the inner roll arm and sink roll shaft end. Through the four improvements of optimizing the bush structure we resolve the problem of the stall and crack in the production. It greatly extended its working life. After Improved structure of the liner – Figure 4. The cracks were found on Stellite6 alloy block part after the structure put into use a period. After analysis the cause of cracks is the welded structure of Stellite6 alloy block and sink roll bush body. In the production the line is under high temperature environment of greater than 600 ℃.The state returns to normal temperature after the offline. 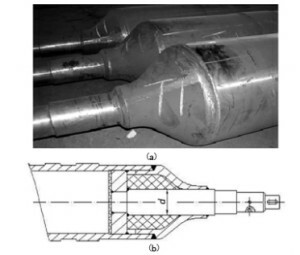 In this process of expansion and contraction, Since Stellite6 alloy material is different with bush body material 00Cr17Ni14Mo2, the thermal expansion coefficient is different, so that Stellite6 alloy subjected to tension and pressing force, thus cracks even breaks were found at weld position. See figure2. 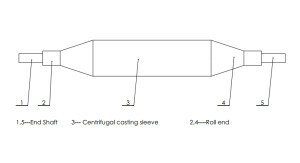 From whole assembly drawings (Figure 3) The clearance between carbide block and sink roll sleeve end is 13 mm, while the spacing between sink roll head and stopper block is 15mm. That means actually the head did not play the effect of reducing friction area. a. 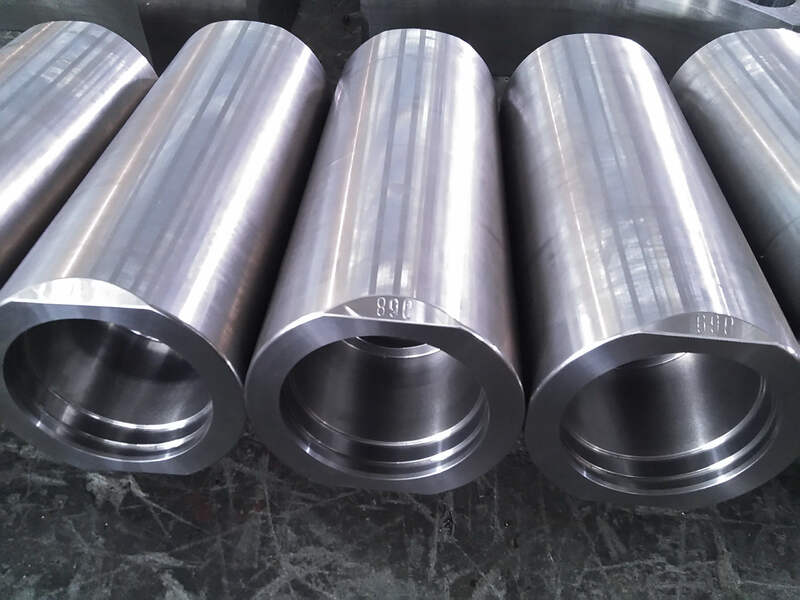 Due to the action in the course of the strip steel, the actual contact surface of the roll sleeve and the bush is in the upper part of the bush. Therefore, the Sellite6 alloy blocks changes to one unit which can still meet the requirements and also reduces the manufacturing cost. b. 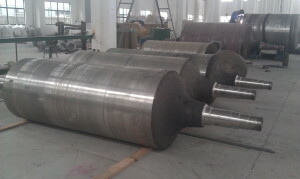 As for Sellite6 alloy part (part 2) installation, two stoppers (part 3) welded at two sides and 2 semicircle with material 00Cr17Ni14Mo2 (part 4) welded at the lower half of the body to support. Not to weld Sellite6 alloy directly with 00Cr17Ni14Mo2 body which reduce the difficulty of construction and potentially dangerous. The CGL unit annual output 250000 ton, produce width of 800 ~ 1 300 mm, thickness of 0. 3 5 ~ 2. 0 mm. The product varieties are full of hard grade, commercial-grade, high-strength steel. The application are mainly household appliances industry and the construction industry and other fields. Sink roll is located just above the zinc pan. when unit continuous product, strip steel is imported into zinc pot , the strip steel is immersed in liquid zinc by the sink roll and changed direction. that is, from entering into the zinc pot, dip into zinc pot, galvanized layer solidification & cooling. And also to be entering the air knife, the strip steel remains stable and flat. With the movement of the strip steel rotating, sink roll bush supported by the bracket of both sides. The bush acts as a sliding bearing. CGL unit sink roll and stabilizing roll off the line after use we found Stellite 6 alloy block had cracks on semicircle parts of the bush. Even alloy block broken. 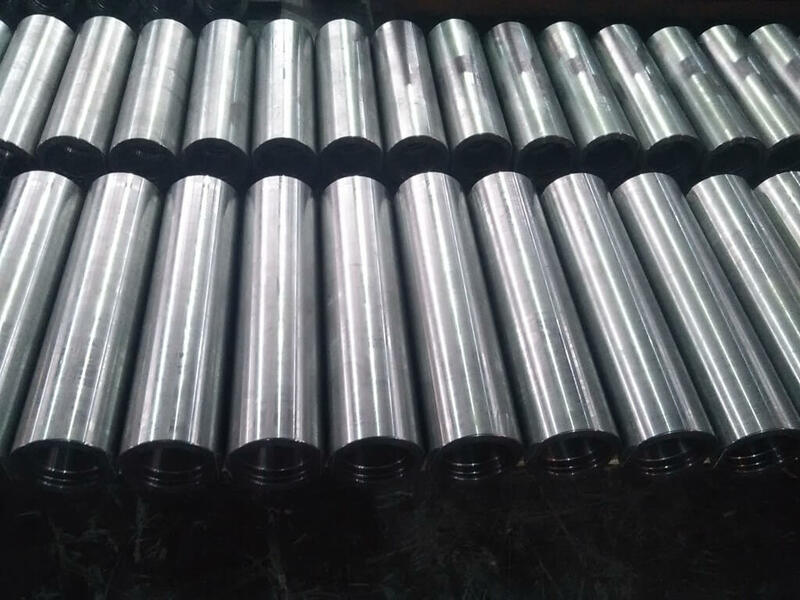 Consequently which affect the normal use of the bushing and resulting in stall phenomenon of stable roll and correction rollers. After analysis and research of the structure and also working condition the structure of bush has more improved to avoid cracks. The original design structure using a semicircle and a 1 / 4 circle, two Stellite6 alloy blocks are welded with bush body, shown in Figure 1. Hearth roll is one of the most important part of continuous annealing furnace. Its working condition is the decisive factor if annealing furnace can be normal production. Working at over 800 ℃ in the furnace and rotation under load, meantime mechanical damage by charge , the hearth roll material must have high temperature strength and oxidation resistance. The structure shown that centrifugal casting roll is a hollow cylinder, two alloy roll end welded. Furthermore two end shaft welded in the roll end. The thin-walled rollers to give axial thermal resistance. The insulation materials inserted from the roll barrel to roll end to reduce the temperature of the bearings. Furnace hearth roll materials are ZG35Ni20Si or ZGCr25Ni35Nb, due to the high Ni alloy is expensive, domestic production of furnace hearth rollers using cheap ZG3Cr24Ni7SiNRe, this material has high temperature strength, endurance strength higher than ZGCr25Ni20Si2, after long-term use aging embrittlement tendency is small. Due to the addition of rare earth the oxidation resistance of the steel improved. The diameter of the furnace hearth roll if possible use of smaller size at high temperature strength permitting to reduce the weight of the weight and save precious metal. The furnace hearth roll commonlu use spiral roller bearings or spherical bearings . The bearing temperature is high so high-temperature grease lubrication is needed. The diameter of haft journal is usually smaller than the 0.1-0.25mm of bearing because of radial expansion. U-type, W-Type, 0-Type, P-type, L-Type, S-Type. Similarly straight-type and also electric radiant tubes. One of centrifugal casting stainless steel products. The radiant tubes are working at high temperature environment on average: 800-1200° C. Therefore most of them are used for indirect heating to furnace like CAL (continuous annealing line). 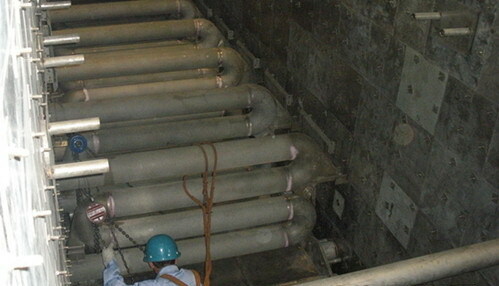 Similarly CGL (continuous galvanizing line). One of centrifugal casting stainless steel products. 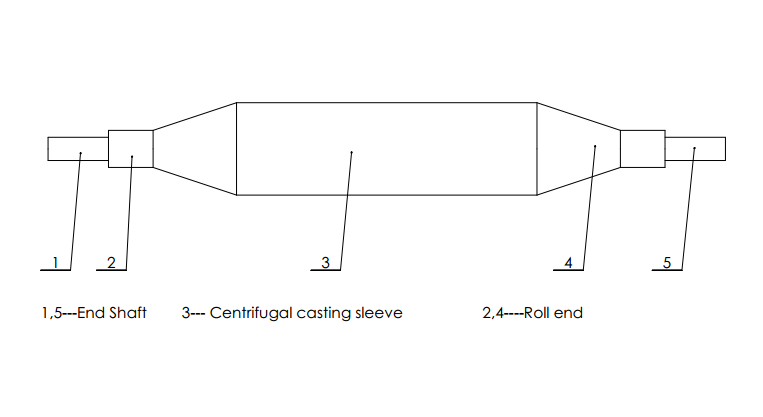 First of all centrifugal/spun casting method for tube sections. Furthermore investment casting or sand casting for the bends, hangers. Then welding and finally machining. High Nickel and high Chrome heat resistant alloys, Cobalt base alloys. The material like HU, HT, HK, HP, HW, 24/24NbTiZr, 50Cr/50Ni (2.4813), 1.4865, 1.4849, 1.4848, 1.4410, 1.4059, 1.4841, 1.4845, 1.4852, 2.4879 or as per customer’s requirements. ANSI, ASTM, ASME, DIN, GB etc. One of centrifugal casting stainless steel products.Centrifugal casting stainless steel roll are of good heat, corrosion, wear resistant properties. Almost all working at high temperature environment on average: 800 to 1, 200° C. As a result which are used in the steel mills. Like continuous annealing line, continuous galvanizing line. Process of centrifugal casting stainless steel products of roll. First of all centrifugal casting for barrel/tube. Furthermore forging for journal/shaft. And static /investment or sand casting for cone/turnings. Then welding and machining and finally grinding. Material of centrifugal casting stainless steel products of roll: High nickel and high chrome heat resistant alloys, cobalt base alloys. The material like HU, HT, HK, HP, HW, 24/24NbTiZr, 50Cr/50Ni (2.4813), 1.4865, 1.4849, 1.4848, 1.4410, 1.4059, 1.4841, 1.4845, 1.4852, 2.4879 or as per customer’s requirements.